beautyamare: Congratulations Charisse! Winner of the Maybelline Giveaway! 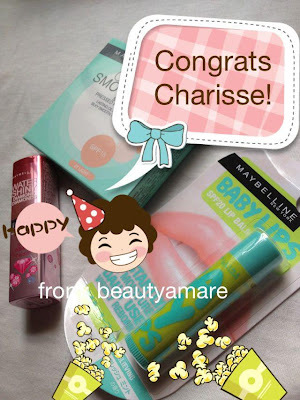 Congratulations Charisse! Winner of the Maybelline Giveaway! Mariel Charisse Beltran of Malaybalay City, Bukidnon Philippines. We will deliver the goods when the box arrives in Philippines on 2nd week of November.We would like to thank the following for their entries and we hope you'll continue to support us. We still have the ongoing 1ST MONTH GIVEAWAYS and we'll announce it during our second monthsary this October 18, 2012.